Over the weekend, several white nationalist rallies in Virginia devolved into violence that culminated when a man drove his car into a group of counter-protestors, killing one person and injuring dozens more. In the wake of the , various officials have referred to the events by myriad descriptors, including "domestic terrorism," and "violence," among others. And late Saturday, the Justice Department announced it was launching an investigation into the deadly crash as a possible civil rights violation. How important is the language used to describe such events? And where are the boundaries between free speech and hate speech, or hate crimes and domestic terrorism? Three Northeastern faculty members, whose expertise encompasses constitutional law, hate crimes, and terrorism, weigh in. Assistant professor Max Abrahms, who studies international security and terrorism, said the weekend's events were unquestionably terrorism. Margaret Burnham, University Distinguished Professor of Law and founder of the Civil Rights and Restorative Justice Project, breaks down the Justice Department investigation and noted that "the demonstration in Virginia on Friday was hateful but it wasn't criminal." And Jack McDevitt, associate dean for research in the College of Social Sciences and Humanities and director of the Institute on Race and Justice, explained that the driver of the car can be charged at both the state and federal levels. How does one determine whether an event was terrorism or something else? Abrahms: There's no consensus over the definition of terrorism throughout the world, and for good reason. People generally use the word instrumentally, in order to delegitimize actors they don't like, or they'll withhold use of the term in order to legitimize actors they do like. In authoritarian countries, for example, leaders will label all dissidents as 'terrorists' whether or not they use violence. Academics, however, tend to agree on who is a terrorist and who is not based on this criterion: A terrorist is a non-state actor who uses violence against a civilian target for some kind of political goal. Based on that criteria, there's no question whatsoever that the violence in Charlottesville was terrorism. In general, Americans, when they think of terrorism, think of international terrorism instead of domestic terrorism. That's a little peculiar because the vast majority of terrorism in the world has historically been domestic. In the U.S., we've had a huge domestic terrorism problem called the Ku Klux Klan. Burnham: Terrorism is as much a term of art as it is a criminal charge. Here, we're talking about whether, as a rhetorical and political matter, it can be considered terrorism. The incident where the gentleman drove his car into a crowd of citizens certainly seems to meet that standard of constituting an act of terror—it was an act meant to interfere with the political rights of citizens in a violent way. Classifying it as domestic terrorism increases the powers of the federal government to investigate, under the PATRIOT Act, introduced after 9/11. Domestic terror in itself is not a crime, but a violation of federal or state law can qualify as domestic terrorism. So, was the violence in Charlottesville terrorism or a hate crime? Abrahms: There's a lot of overlap between a hate crime and terrorism; they're not mutually exclusive by any stretch. A hate crime is prosecuted more severely than a non-hate crime because there's an understanding that the pain caused by the crime goes beyond the immediate victim—it spreads fear more broadly. The same is true of terrorism: There's a broader audience than the immediate source of violence. The difference is that, when we're talking about terrorism, we're always talking about violence, whereas a hate crime can be something like graffiti. McDevitt: Hate crimes are terrorism—it's not a Venn diagram. Terrorism is trying to send a message that you're destabilizing something, and hate crimes are all about sending a message. Late Saturday, Attorney General Jeff Sessions announced that the Justice Department was opening a civil rights investigation into the incident in which a man drove a car into a crowd of counter-protestors, killing one. What will the Justice Department be looking for, specifically? Burnham: In 1968, the Civil Rights Act added legislation that makes it a federal crime to use force to willfully injure or intimidate any citizen because they were participating in lawful speech or assembly. It gives prosecutors the opportunity to bring a case if the speech or action was directed against an individual, and in this case, it seems pretty clear it was directed generally against a large group of people. If the conduct of the driver of the car, James Alex Fields, Jr., was motivated by a desire to harm people on account of what they were saying, that would be a civil rights violation, but prosecutors would have to find that motive. Even though the murder victim in this case was a white woman, if he attacked her on account of her affiliation with, or her support for the rights of certain targeted groups, it's possible he could be charged with a hate crime. State law enforcement officials in Virginia have charged Fields with second-degree murder in the attack. Would a federal indictment, should there be one, supersede the state charge? McDevitt: There's no double jeopardy rule for state- and federal charges. People can be prosecuted for both. The real issue for the federal prosecutors is whether they can document that his intention was driven by bias. Organizers have described the Virginia rallies as "free speech rallies," though they descended into violence. Where is the line between protected free speech and hate speech? McDevitt: Protected free speech is not a crime—you can stand up on a stage and say whatever you want. Where that starts to change is if you then look down from the stage and call out an individual person. That becomes a threat, and protected free speech goes away. The other difference is, you can't yell "fire!" in a movie theater when there isn't one, because the implication is that people will get hurt trying to escape. 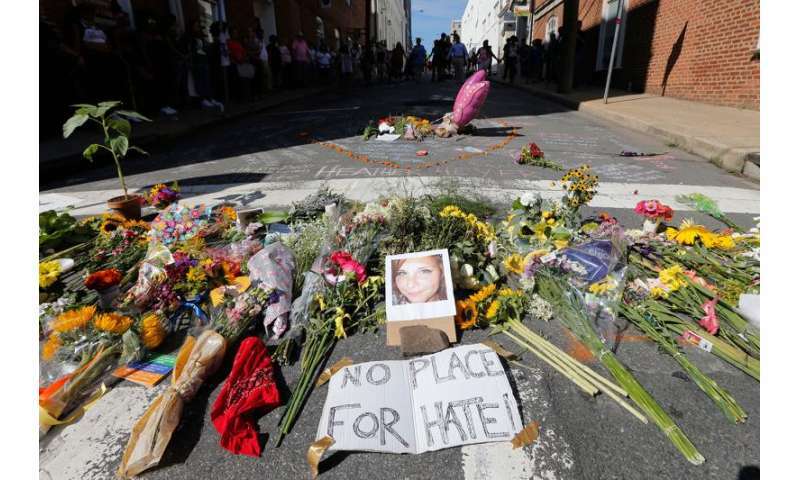 Prosecutors could argue the events in Virginia would fall into that last rubric because the language they were using was meant to stir up violence. Burnham: The demonstration in Virginia on Friday was hateful but it wasn't criminal. Indeed, not only was it not criminal, it was First Amendment protected, even though it may have looked exactly like a Klan rally. Free speech is constitutionally protected; not only is there a subjective right of individuals to express their points of view, there's also an object of dynamic—people who want to speak within the context of the First Amendment are guaranteed the protection to do so. When the speech devolves into a street brawl, then there are all kinds of other legal prohibitions that come into play. But, for all of these free speech rallies, the American Constitution holds speech as an important value. That value, though, is a means of promoting democratic involvement. So even when the speech is really about excluding certain groups from participation, it's still protected speech even though it seems to defeat the whole purpose of the very values intended to be protected by the First Amendment. That's the bargain that the Founding Fathers struck. The issue of language can also bring in misrepresentation of fake news. The article speaks of the event "devolving" into violence. Vague and avoiding mentioning who started the violence. Because those opposing hatred of whites didn't start it, it was those who hate whites who did. There is no record of those who oppose hatred of whites starting any violence at any event, march, protest. The "news" would have been all over the story if those who oppose hatred of whites attacked first! Instead, the "news" uses the code word "clash", which they always employ to avoid admitting the followers of what has come to be called "liberalism" and the Democratic Party started the violence. The Atlantic even displays a photo of a black man using a homemade flame thrower on a white! Too, it is not acceptable to harm anyone, but before condemning the driver, remember the Colonists are applauded for being willing to kill friends to avoid paying a tax on tea!